Do you know what these are? They don't show up on the farm every year. In fact, last summer was the first time I finally had a chance to taste one. Hint: these aren't ripe yet. Think you have them correctly identified? Click here to see if you're right. My first thought was mango, but I don't think that's right. Well I was going to say they look like apricots too, but why would they not show up every year? I guess I give up. Yep! My guess, too, was paw-paw. Delicious! My grandmother had them in her yard--sort of a banana custard-y taste, creamy texture. Mmmm! Paw-Paw. At first I thought black walnut? But then I saw the shape of them. When the black walnuts still had that green stuff on them that was black inside, I used to put them in the chicken pen because the green stuff was full of worms. The chickens had a great messy time cleaning it off and taking care of the worms. Then I would leave the hard nuts in there for a while so the chickns would walk on them with their little dusty feet. Next, hose them well, put in a clean gunny sack and drive the truck over them. Nicely cleaned and cracked black walnuts. paw paw, of course. I haven't found any yet in my woods. I thought of figs, too. It's a paw paw. They taste like bananas. My inlaws pick and eat them. Your daily farm photo and your site have me yearning for the farmlife. I decided last night (in the wee hours of the morning, actually) that my new visualization for bio-feedback (how I get my restless mind to sleep) will go from the white house in the meadow (I've had it for 13 years or so) to a farm house. Life is grand! And I figured out how to post a picture to my blogsite this morning, so I'm doubly delighted this afternoon! Okay, I did my research and think that it is amazing that those things grow at all, especially in MO!!! They have to be pollinated from a non-related ______ tree. Hm.. And bees don't like the flowers, so it's flies, bettles, or humans. I'm assuming that yours pollinated itself. I learned several new things today!!! Thanks! They look like figs to me! I'm thinking they're figs too. I thought they were almonds. The leaves are wrong for pawpaw/papaya, and the climate wouldn't be humid enough. Apart from knowing what they aren't, I have no idea! Those look like green almonds to me as well: I remember them from Greece. You can eat them while they are green. Both the leaves and the fruit look like my English walnuts, or rather here they are called noci. I shouldn't think almonds would grow in MO? 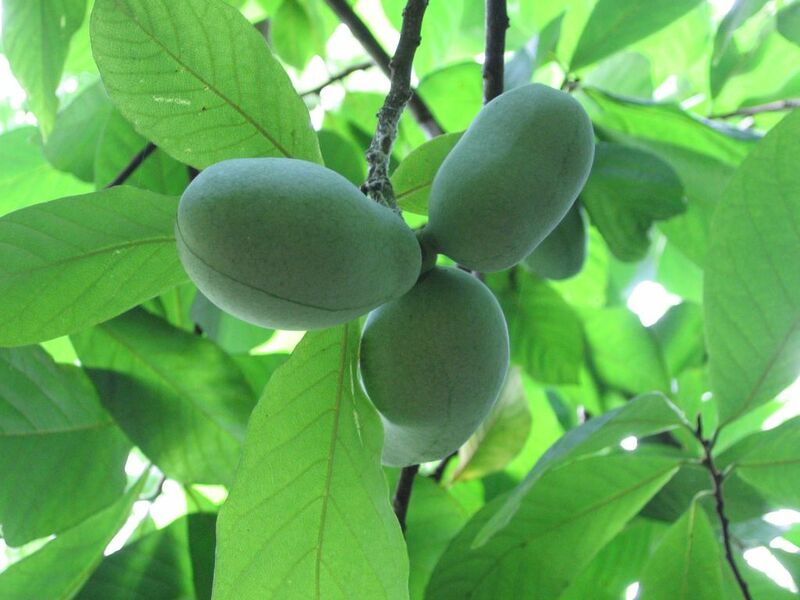 "American pawpaw (note the different spelling) on the other hand is an entirely different fruit not related to the tropical Carica papaya from which Australian red papaya and yellow papaw come. American pawpaw is also known as ‘poor man’s banana’ and is the fruit of the Asimina triloba tree." Paw Paws. I just planted several along my creek. Yum. They are Paw-Paws and they are delish... they taste somewhat like bananas. I am somewhat of a neighbor... in Kansas, and we have a Paw-Paw tree growing across the street. I am a perpetual pest to my neighbor's when they are ripe. I guess I need to get my own tree. Absolutely, 100%, no mistaking it - Paw Paws. There is nothing else that looks like that fruit combined with that leaf. We pick them at the end of every summer here in KS and use them in cakes, pies, muffins, ice cream and anything else you can think of that you could make with a fruity flavor. It is THE favorite fruit of my family and we look forward to the outings for them every year. Finding them is like one long Easter Egg hunt for the kids and they are absolutely delicious with a unique flavor! They are also extremely good for you.